It may be surprising that I started the year with such a depressing book, but I felt ready today to read this poetry pamphlet. Lesléa Newman delivered these poems at the University of Wyoming five days after Matthew Shepard’s murder. Matthew Shepard is to the LGBTQ movement what Emmett Till was to the Civil Rights Movement. Shepard was kidnapped and tortured by two boys on the night of October 6, 1998. He was found tied to a fence by a cyclist who mistook the body for a scarecrow. 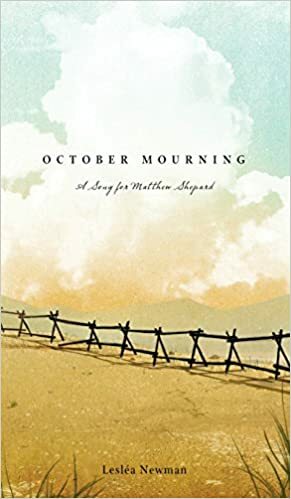 The poems in October Mourning: A Song for Matthew Shepard are told from a variety of perspectives – some inanimate. Each section begins with a poem from the fence’s perspective, and most of the poems begin with a quote from one of the actual people involved in the case. According to the pamphlet, Newman was heavily inspired by the structure of “This is Just to Say” by William Carlos Williams. I was the most moved by the poems that addressed the national response to Shepard’s murder. “A Chorus of Parents”, “Then and Now”, and “The Drag Queen” were my favorite in the collection. Not all of the poems were brilliant. A few were frankly pretty trite. But overall, I felt that Newman captured well Shepard’s influence on the Gay Rights Movement. We must not forget the son, student, and lover behind the involuntary martyr. Now I am a lesson. This is my recitation of Guillaume Apollinaire’s Zone (1913) in French. This poem seems particularly relevant today. My prayer for this year is that people everywhere can acknowledge each other better. Our lives and actions are so interconnected.